Surfing through the television channels recently – as one does – I caught a few minutes of the Classic Brit awards . Violinist Tasmin Little, having received the Critics’ Award, was delivering a rather passionate speech about the importance of what we commonly call “classical music”, and of the dangers of sidelining it, or of trivialising it. The very next “Classical Brit” award was something called “Artist of the Decade”. It went to boy band Il Divo. It’s such a simple idea, but so effective. If you were stranded on a desert island, and had, miraculously, some machine on which to play music, which eight pieces of music would you choose? And which of those eight would you keep if you could keep only one? The answers are so very revealing. Some choose music for reasons of nostalgia; some for the quality of the music; and some, one suspects, to make a certain impression, or to project a certain image. But whatever the reason (and one can usually tell from listening to the programme) it is a fascinating idea, and extraordinarily revealing of the guest’s personality and cultural preferences. So successful has this simple formula been, that the programme will shortly celebrate its 60th anniversary. In addition to the eight pieces of music, they are allowed to pick one luxury, and one book apart from the Bible and the Complete Works of Shakespeare – which, we are told, are already on the island, it being assumed by the programme creator Roy Plomley that these two choices were so obvious that just about everyone would go for one or the other. Of course, things have changed since Roy Plomley’s days: on being told they’d be given the Bible, some guests nowadays react as if they’d been told they’d be given a dog turd. A few seem quite shocked that they’d have to pick a book at all, and try desperately to think of some book they’ve heard of. On the other hand, there are those delighted to be getting the Bible and Shakespeare: I remember Robbie Coltrane on this programme commenting that if some alien life form wanted to know what humanity was like, the best thing one could do would be to hand them a copy of Shakespeare. (His own choice apart from the Bible and Shakespeare was a Raymond Chandler novel – obviously a man of good taste and discernment!) But however they react, it’s revealing. In preparation for the 60th anniversary celebrations, the BBC has put up on its website all the choices ever made by various guests since the programme started. It makes, I find, for addictive browsing. I like seeing the surprising choices – such as Oliver Reed showing his sensitive side by choosing Debussy’s “Jardins sous la pluie” from Estampes (I wouldn’t look too closely at his luxury choice, mind you! ); or the distinguished historian Sir Martin Gilbert choosing Abba singing “Super Trooper”. This would be my one choice if I were restricted to one. I have written on this blog before about my love of Mozart’s music, so I won’t go through all that again. But, quite apart from that, this is a work my wife and I particularly love, and it has many personal associations for us. This is music I grew up with at home. Tagore’s songs (Rabindrasangeet) are, effectively, the national music of Bengal. Growing up in Britain, I was picking up and absorbing all sorts of Western influences, but this was the culture I had at home. It’s hard to say whether I enjoy listening to this music because it brings back childhood years so vividly, or because the music itself is very good: a bit of both, I think. After all, glam rock of the early 70s was also part of my growing up, but I can’t say I make any special effort now to seek it out. This, however, is different. Shapmochan (literally “The Breaking of the Spell”) is either a traditional folk story, or a story made up by Tagore in the folk style: I’m not sure. The story is narrated by a speaker, and is interspersed with some of Rabindranath’s loveliest and most moving songs. Since I can’t pick all the songs, I’ll pick the first – a tender, haunting melody of farewell. I’ve always felt personally close to Brahms’ music, and this, effectively a symphony with a piano, is one of the old boy’s best. This was recorded live from a concert given in 1972 inNew York, and it is the most exhilarating piece of music making I think I have ever heard. All three of these very great musicians – Ravi Shankar (sitar), Ali Akbar Khan (sarod) and Alla Rakha (tabla) – were on red-hot form that night. This piece is about half an hour long, and is, effectively, one continuous accelerando. Just when you think it can’t get any faster, it does – and the precision with which these three toss around musical phrases of great rhythmic complexity at ever-increasing tempi is mind-boggling, and takes one’s breath away. Schwanengesang was Schubert’s last collection of songs, and they are songs of pain and longing and desire. It’s virtually impossible to pick out just one song, but since them’s the rules, them’s the rules. This particular song is a setting of a poem by Heine, and, as with the Tagore song I picked earlier, it’s a song about a parting. But the mood here is deeply ambiguous. I don’t think I’ve ever heard anything quite so haunting. We all know the story of how Beethoven took a simple and trivial little theme composed by Anton Diabelli – a music publisher – and wrote 33 variations on it, transforming something utterly trivial into a massive work that communicates all moods and all states of mind imaginable, and, by the end, seems to transcend everything as it moves into new regions of sound. It seems to me sometimes a metaphor for creation itself: it’s the emergence of an entire universe out of nothing. This is something else I grew up with at home. Nirmalendu was a singer of Bengali folk songs, and had the most phenomenal voice and singing technique. This song is a traditional boatman’s song (“bhatiali”), and contemplates the immensity of the river. (And you can put on that whatever metaphoric interpretation you want.) It starts quietly, but develops towards a climax of tremendous passion. The adjective “soulful” may almost have been invented just for this song. I would like some modernist music as well on my desert island, and I have long loved the wild passions and the passages of weird nocturnal stillness in Bartók’s string quartets. I have picked the 5th – but really, I could just as easily have picked any of the other five. So, those are my eight. The BBC doesn’t ask us to choose a book or a luxury, which is just as well, because I really wouldn’t know what to choose. I’ll have the Bible and Shakespeare, which are both welcome, but then what? War and Peace? A Dickens novel? The poems of Tagore, perhaps, or of Wordsworth? The plays of Ibsen? I think I may just choose the complete Sherlock Holmes stories instead, but … who knows? Well, those are my choices. And I’d be interested in any other personal Desert Island Discs choices from anyone else out in the blogosphere. It is now about six months since I finished The Brothers Karamazov, and, although I have read some top drawer stuff since, it continues to haunt my mind. And yet, if someone were to ask me if I liked it, I really wouldn’t know what to answer. Looking back over the posts I put up here at the time, I can see that, quite frequently, I found myself disturbed, I found myself puzzled – I found myself thinking that certain things didn’t seem to make much sense; at times, I even found myself shaking my head and thinking this won’t do. If a detractor were to go through with me, item by item, all the shortcomings or alleged shortcomings of the novel, Iwould possibly nod away in agreement on just about every point. And yet, for all that, The Brothers Karamazov continues to fsacinate me – it haunts my mind like little else I’ve read. Is that not strange? Literature is not like ice cream flavours. I could say with a fair degree of crtainty that I like vanilla flavour but not strawberry, but it’s not possible to make such cut and dried statements when it comes to literature. We may admire books that we can see are flawless products of the finest artistry, and yet remain untouched; and conversely, works riddled with flaws can take over one’s mind. This is not to say, of course, that artistry is irrelevant: that would be silly. Literature can only really be judged by literary criteria after all, and a work devoid of literary qualities is a bad work. The Brothers Karamazov clearly does not fall in that category. But it is a work of such individuality and idiosyncracy, and of such undoubted stature, that it compels us to re-assess what our literary criteria are. It compels us, inded, to re-assess everything we had previously taken for granted. So, as to whether or not I like The Brothers Karamazov, I really don’t know. But it increasingly strikes me as in irrelevant question. It was back in the mid 1990s that I first became aware of the novel Life and Fate by Vasily Grossman. I remember seeing it in a bookshop, and thinking with a smile that only a Russian could write a 900-page novel and call it Life and Fate. There was a quote on the cover from George Steiner saying that “novels [such as this] eclipse almost all that passes for serious fiction in the West today”. Being an aficionado of the Russian literature (both pre- and post-Revolution) I made a mental note to read this when my To-Be-Read shelf was not quite so crowded. But after a time, realising how pointless it was to wait for my To-Be-Read shelf ever to reduce to manageable proportions, I decided to forget whatever else it was I had on my reading list, and to plunge straight into this. The novel is a vast epic covering Stalingrad, Stalinist oppression, Nazi death camps – i.e. some of the most unspeakably horrendous events in a century that has possibly had more than its fair share of unspeakably horrendous events. Of course, there is nothing wrong with writing about such things – indeed, such things should be written about: but we have been so inundated with so many frankly mediocre books dealing with big historical events, that a certain cynicism does, I’m afraid, set in. Such is the nature of these events, that the very mention of them, or a mere recital of a few ascertained facts, can make a huge emotional impact on the reader, thus saving the writer the very great trouble of having to work for it. The very cynical term for this sort of thing is “hitching a ride on the Holocaust”. There were many examples of this I could think of off the top of my head. Is it not possible, or even for that matter probable, that Life and Fate was yet another such work? But I thought it worthwhile to take a chance on this. There did exist, after all, works of genuine merit that had dealt with horrendous historic events – from Primo Levi’s writings to Claude Lanzmann’s Shoah, to Satyajit Ray’s sadly little-known cinematic masterpiece Ashani Sanket (Distant Thunder), set against the background of the Bengal Famine of 1942-43. Life and Fate was worth a try, at the very least. I needn’t have worried. It didn’t take me long to realise that I was reading something very special. Just how special it was struck me with full force on my commuter bus to work one morning (then, as now, I did most of my reading while commuting). An elderly Jewish lady living in Ukraine knows that the invading Nazis will murder her, and all Jewish people in the region: there is no escape. And on her last night alive, she writes a letter to her son, hoping that, somehow, the letter will reach him. I am not by nature a lachrymose person, but I suddenly felt that I could not read on, and I had to put the book down. When had I last been quite so moved by fiction, I wondered? I did not at the time know of the autobiographical element of this. Grossman’s own mother had been amongst those many murdered by the advancing Nazis. Grossman himself was not sure of his mother’s fate (though he presumably suspected the worst) until the Red Army re-conquered Ukraine, and the full scale of the horror became apparent. This letter in the novel that had moved me so is the letter Grossman imagined his mother writing to him. There is no sentimentality in any of this, no false emotion: when the emotion itself is so powerful, it does not need to be faked. And the expression is direct and simple, as it has to be, for anything that is not direct or simple in this context would have about it a sense of artifice. And that would be very out of place here. Grossman would no doubt have agreed with Tolstoy that there can be no greatness where simplicity, goodness and truth are absent. From then on, there was no doubt whatever of the quality of what I was reading. The scope is vast, and, given that we are talking of an epic Russian novel dealing with people caught up in historical events of seismic proportions, the label “Tolstoyan” becomes inevitable. But it is a mark of Grossman’s artistry that the work isn’t overwhelmed by this label. We see the fighting atStalingrad (which Grossman, as a war reporter, had witnessed at first hand); we witness the Soviet Gulags, and the Nazi death camps; at one point, we even follow a group of people into the gas chamber itself. We witness the Stalinist crackdowns, the betrayal of the hopes of freedom that had arisen during the heroic resistance atStalingrad. We witness, indeed, some of the most grotesque and nerve-shattering events of the century. And at no point is there the slightest hint of “hitching a ride on the holocaust”. For, no matter how wide the focus, Grossman’s interest lay in individuals: if his background as a journalist gave him a good grasp of wider events, his genius as a novelist allowed him to penetrate into individual minds, and imagine how individuals would feel, how they would react, under the most unimaginable of circumstances. And it is here that his greatness lies: one may learn of great historic events from historians, but to understand how individual human beings felt and behaved in the midst of such events, it is to a novelist such as Vasily Grossman that we must turn. Falsehood is so easy, truth so difficult. The pencil is conscious of a delightful facility in drawing a griffin – the longer the claws, and the larger the wings, the better; but that marvellous facility which we mistook for genius is apt to forsake us when we want to draw a real unexaggerated lion. However difficult the truth was, Grossman did not shirk it. He exercised his imagination to the highest pitch – not by imagining a griffin, but by depicting with truth and with understanding the real, unexaggerated lion. 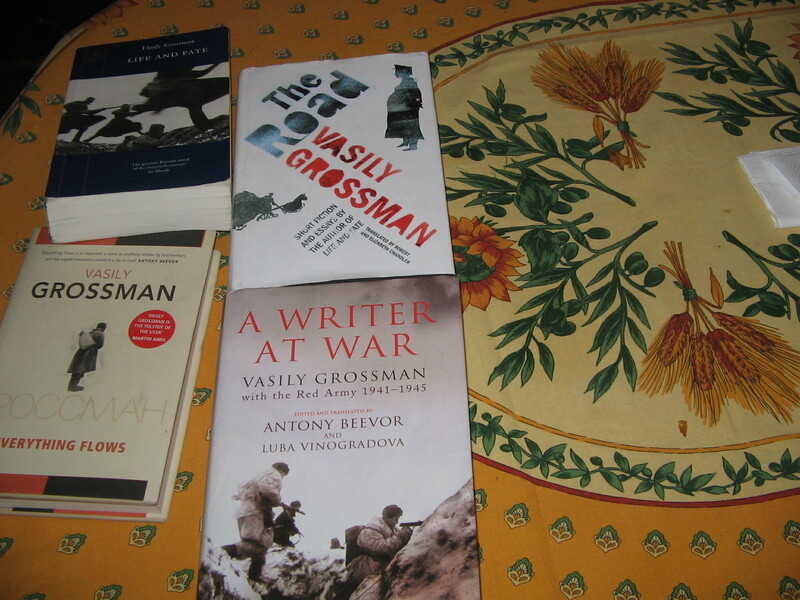 A few years ago, Anthony Beevor (author of the highly acclaimed Stalingrad and Berlin) and Luba Vinogradova edited and translated a volume of Grossman’s wartime reporting entitled A Writer at War. And, more recently, there has appeared a translation by Robert and Elizabeth Chandler, with Anna Aslanyan, of Grossman’s unfinished novel Everything Flows; and also translations, again by the Chandlers, but this time with Olga Mukovnikova, of various essays and short stories of Grossman under the collective title The Road. I have spent the last few weeks immersing myself in these three volumes. I won’t pretend that this was a pleasant experience, but if anything qualifies as “required reading”, then these volumes are, I’d guess, strong contenders. A Writer at War intersperses Grossman’s writings with linking commentary by the editors, placing the writings in context. We are presented both with finished articles, and also with a great many of Grossman’s surviving notes, some of which deal with matters that could not obviously be published at the time – e.g. Stalin’s misreading of the situation to begin with; or the treatment meted out to deserters, or to those who try to injure themselves in futile attempts to avoid combat. And, of course, the collaborators: any mention of collaborators in published reports was strictly taboo. Grossman was involved in the campaign from the very beginning. He witnessed the seemingly unstoppable advance of the Nazis, the gross mismanagement of the Russian war efforts at the start, and then, most importantly for Grossman, the extraordinary heroism of the ordinary soldiers. For Grossman was never in any doubt that this was a war against an evil enemy, and a war that had to be won. There seems also to be a sense at times that this was a war not merely against Nazism, but for freedom itself: of course, Stalin dashed any such hope as quickly as he could, but this hope did exist all the same, and is apparent also in sections of Life and Fate. Grossman himself was tremendously lucky to survive – insofar as the word “lucky” is at all appropriate for someone who had to live through and witness such terrors. Once, a hand grenade landed between his feet, but miraculously failed to go off. He would be lucky again not to fall victim to Stalin’s purges: had Stalin not died when he did, Grossman would most likely have ended up yet one more of Stalin’s victims. But Grossman’s physical courage was immense: he was, more often than not, on the west bank of the Volga to report at first hand, rather than in the comparative safety of the east bank. He seemed to have got on well with the soldiers, whom he clearly admired; and his reports, quite clearly accounts of first hand experience, must surely be amongst the finest of all wartime reporting. In both his fictional and his journalistic treatments of the Shoah Grossman does all he can to restore their dignity to the dead and to enable the reader to see them as individuals. He does not appear to have shown this photograph to his friends and family, and it is unlikely that he would have wanted to show it to readers. Very likely he would have agreed with Claude Lanzmann, who dismissed such photographs as “images without imagination […] inexact visual renderings that allow viewers to indulge in an unsavoury and misleading spectacle at the expense of a past that could only be tapped by a strenuous effort of listening, learning, and imagining”. Grossman himself made the “strenuous effort of listening, learning, and imagining”: he was careful never to reduce the horrors merely to numbers. The numbers themselves, mere statistics, seem meaningless after a while: the human mind cannot grasp the enormity of numbers so large. Grossman’s interest was always with people, with individuals. Even in the hell that he witnessed, he kept faith in humanity. Even amidst the mass carnage, he could see the overwhelming significance of a dead soldier lying next to a childish scrawl, of that man thinking of his child back home as he departs from his life. And no, this is not sentimentality. And hells don’t come more hellish than Treblinka. I don’t think I have read anything quite as devastating as Grossman’s report from Treblinka, written just days after the Red Army took possession of its remains. It is perhaps best of me not to try to summarise the contents of that report; and it is perhaps not right, given the nature of those contents, to draw attention to the quality of writing. But for all that, to communicate the enormity of it all without reducing the victims merely to statistics does require writing of the very highest quality; and this is what we have here. This report, which formed part of the evidence presented at the Nuremberg trials, appears in A Writer at War, and in a somewhat fuller version in The Road. I am not sure why Beevor and Vinogradova chose to edit down this report in their volume, because it should really be mandatory reading in its entirety. Mandatory reading for everyone. We hear of those who witnessed the remains of the death camps after liberation, and who felt unable to talk about what they had witnessed; but Grossman knew that not only was it his job to bear witness, it was also his duty. He breaks off his narration at one point to acknowledge that what he is writing must be hard to read; however, he tells us, it is equally hard to write. But it has to be written. And it isn’t merely a recital of statistics – indeed, Grossman actually overestimates the number of victims, although adjusting the figures down to correct levels does nothing to diminish the intensity of the horror. But Grossman does not want to communicate the tragedy in terms merely of numbers, but, rather, in terms of individual human lives that were wiped out, for no reason that can make sense to a rational mind. The earth is casting up fragments of bone, teeth, sheets of paper, clothes, things of all kinds. The earth does not want to keep secrets. After writing this report, Grossman, who had witnessed the hideous evils even of Stalingrad, had something of a nervous breakdown. It must have required tremendous courage, both mental and physical, to return to the front so shortly afterwards to cover the advance into Berlin. It is possibly here that Grossman, for perhaps the one and only time, went into denial for a while. As a journalist, he was well aware of the atrocities now being committed by advancing Russian troops, especially of the horrendous mass rapes. He clearly found it hard to come to terms with the fact that those whose heroism he had so admired in Stalingrad were the very people now committing these latestatrocities, and he blamed these acts on rear units. But, as Beevor and Vinogradova remind us, it was the front-line tank troops who were the worst looters and rapists. Of course, there were certain things that could not be printed, but in his notes, Grossman was too honest not to record these events. But victory, however hard won and however terrible the price, was sweet. What followed was, as we now know, renewed Stalinist oppression. Grossman had believed that antisemitism was specifically a fascist phenomenon: when for instance, an antisemitic comment made by writer Mikhail Solokhov was reported, Grossman had thought it an exception rather than the rule. He was soon disabused. After the defeat of the Germans, Stalin needed a new enemy, and his attention turned to the Jews. Antisemitism became, in effect, state policy. It may not have been genocidal as its German counterpart had been, but it was bad enough. Grossman had joined the Jewish Anti-Fascist Committee in 1942, at the urging of fellow writer and war correspondent Ilya Ehrenberg. Later that year, the Jewish Anti-Fascist Committee had been contacted by Einstein and other members of the American Committee of Jewish Writers, Artists and Scientists, who requested them to compile an exhaustive record of crimes against humanity committed by the Nazis in the Soviet Union. Ehrenberg took the lead in this, and he recruited Grossman in early 1943 to work on what later came to be known as the Black Book. However, as early as 1944, Ehrenberg sensed, rightly as it turned out, that the book will not see light of day under Stalinist rule. Grossman, more optimistic, continued to work on it, but Ehrenberg’s fears proved well-grounded: in October 1947, the Committee was told that the book contained “grave political errors”, and the book was suppressed. Soon afterwards, the Committee itself was suppressed: in 1948, the Jewish Anti-Fascist Committee was disbanded; fifteen of its members were arrested, tortured, and put on trial; and thirteen of them were shot. In January 1953, a group of doctors, mostly Jewish, were accused of attempting to murder Stalin. The official Soviet newspapers screamed antisemitic propaganda, and many Jews were summarily dismissed, arrested, sentenced, or shot. (Grossman had depicted this Soviet campaign of antisemitism in Life and Fate, but had brought these events forward a few years, closer to the War, to underline the betrayal of the hopes that victory had, for a while, nurtured.) It is likely that Grossman only managed to avoid being shot himself thanks to Stalin’s death in 1953. It was, indeed, miraculous that Grossman had survived at all, given Stalin’s personal dislike for him. As with the grenade landing between his feet but failing to explode, Grossman had been “lucky”. The true nature of Grossman’s – or anyone else’s – political beliefs in the 1930s is almost impossible to ascertain; no evidence – no letter, diary or even report by an N.K.V.D. informer – can ever be considered entirely reliable. The other stories and essays in The Road – with each section of the book prefaced by excellent and informative introductory essays by the translators – are scarcely less memorable. As the Chandlers point out in one of their introduction, Grossman’s later stories seem increasingly close to the imaginative world of his friend Andrey Platonov, who had died in 1951. (Robert and Elizabeth Chandler had previously translated, with Angela Livingstone, a collection of Platonov’s stories, published by Harvill under the title The Return and Other Stories: these are some of the most remarkable short stories of the 20th century that I have come across.) There seems to be a shift in these later stories from the journalistic solidity of Grossman’s other writings towards a more poetic sensibility. Quite often, the human world with all its many vicissitudes is viewed from the perspective of animals. The title story, for instance, “The Road”, is an account of Stalingrad from the perspective of a mule. One imagines that it could only be coincidental that, some five or so years after Grossman had written this story, the French film-maker Robert Bresson should make one of his finest films, Au Hasard Balthasar, depicting the turmoil of human affairs from the perspective of a donkey. He looked at his wife’s bed, at his own withered fingers […] He gave a wheeze and fell silent. Still gazing down from above, still turned towards him, were the kind and compassionate maternal eyes. Perhaps the most striking pieces of writing in The Road are Grossman’s report from Treblinka, and the two letters written to his dead mother. The other stories and essays in the volume are also remarkable works, bespeaking a writer who seems almost to embody those qualities that Tolstoy had insisted were the prerequisites of greatness – “simplicity, goodness and truth”. That such a man could even have existed through such times seems incredible. But Grossman himself was aware of the moral compromises that even the best had to make simply to survive: like Primo Levi and Aleksandr Solzhenitsyn, Grossman knew that the only ones who weren’t in any way morally compromised were precisely those who could not tell the tale of what happened, because they were dead. All who were still living, himself included, were compromised in some way or other. The concept of moral compromise is very much to the forefront in Everything Flows, the extremely uncompromising novel Grossman left unfinished at the time of his death. Indeed, it can barely be called a novel at all. It is part fiction, part journalism, and part furious polemic. Grossman must have known that this work could never be published; but he knew as well towards the end that he was dying, and I imagine that he wrote this not for publication, but for himself: there were certain things that he had to say, that he had to get down on paper. There is a fury in the writing, a fury that could no longer be restrained. The plot, such as it is, ostensibly concerns Ivan, a political prisoner freed after the death of Stalin. He meets with his careerist cousin, a well-meaning enough chap, but who, whether he likes it or not, is, like so many others, morally compromised. The awkward dialogue between the two displays a sly humour I had not expected from Grossman, and reminded me that Grossman’s favourite writer was, after all, Chekhov. Soon, Ivan moves away from his cousin. After a while, he takes up with his landlady, Anna Sergeyevna, who had been a minor official in Ukraine during the Terror Famine of 1932-3. Grossman had not personally witnessed this famine, but, as in his depictions of Nazi death camps, he used his journalistic skills to re-create the events, and his novelistic skills to imagine what it must have been like to have lived – and died – in such times. In the introductory essay to the novel, the Chandlers cite as comparison Dante’s depiction of Ugolino and his sons starving to death. But generally, famine has not featured too prominently in the arts*. And it is doubtful that it could be presented with greater power than it is here. The writing is as compassionate as ever, but, at the same time, angry and accusatory. There is no room here for obfuscation: the terrible human catastrophe was a result of deliberate policy, and Grossman knew all too well who was to blame. And it was not just Stalin: Stalin couldn’t have done all this on his own. There was an entire army of henchmen, of arselickers, of idealist fools driven by ideology, or by amoral opportunists driven by mere selfishness. Grossman angrily quotes Maksim Gorky who, at the height of the famine, was burbling away from the comfort of his dacha about the importance of giving educational toys to children. Educational toys? Did Gorky know of what was happening to children as a consequence of deliberate policy of the government he so supported? Perhaps he did. Perhaps he was past caring. And even people otherwise decent are drawn into this nightmare, and made morally complicit. The entire chapter describing the famine is narrated by Ivan’s landlady and lover, Anna Sergeyevna, who, having been at the time a minor official in Ukraine, is aware of her own complicity in the horror. The novel moves on to the Gulags. When Grossman was writing this, information about the Gulags was not readily available: he had to use all his journalistic skills to piece together what had happened. And, to judge by the copious notes at the end of the volume, he had done a remarkable job. And, as ever, Grossman the Novelist was every bit as remarkable as Grossman the Journalist: Grossman the Journalist could piece together what had happened, but it needed Grossman the Novelist to depict humans in the midst of all this. How does a mother feel when she is found guilty of having failed to inform on her own husband, and is sentenced to ten years of hard labour in Siberia? What goes through the mind when, without being given any time to take in what is happening to her, she is bundled away into a Black Maria, away from her beloved little daughter, and then put into a convict train bound for Siberia? How does her mind react when it finally dawns on her that she never will see her daughter again? The latter part of the book is a polemic on the nature of the Terror. Grossman has no time for the school of thought that sees Stalin’s Terror as a departure from Leninism: while acknowledging the very salient differences between Lenin and Stalin, Grossman insists that the terror that reached its peak under Stalin had been set in motion by his predecessor. And yes, the cultured Vladimir Ulyanov, that kind man who loved reading Tolstoy and who was moved to tears by Beethoven’s Appassionata sonata, nonetheless committed crimes that rendered irrelevant whatever private virtues he had. Grossman also attempts to relate the Soviet tyranny withRussia’s history of oppression and of serfdom. I am not sufficiently well versed in Russian history to comment on Grossman’s analysis: given the intensity of his anger that seems virtually to leap off the page, I do wonder how much of this was written in fits of passion, and how much Grossman may himself may have revised had he been able to prepare the book for publication. Everything Flows is an unfinished work. It is an imperfect, unbalanced work. But more than just about anything else I can think of, it reads like a work written because its author had to write it. As with Life and Fate and The Road, we are lucky to have such works available to us in such wonderful translations. Most likely, Grossman himself, as he lay dying of lung cancer, in utter obscurity, left alone by the authorities because they no longer thought him to be of any real consequence, couldn’t have imagined that his writings would be read by posterity. Now that the Mighty has fallen, what has survived is that which the Mighty had attempted with all its Might to suppress. The times Grossman wrote about were times of insanity on the largest possible scale, and the stench of its unspeakable evil lingers still; but for all that, the very fact that these writings survive, despite everything, seems to me a sort of victory. * I myself have not yet read Dante – although I do have Robin Kirkpatrick’s translations lined up for this summer. The only other depiction of famine I can think of in the arts is Satyajit Ray’s film Ashani Sanket, depicting the early stages of the catastrophic Bengal Famine. (Quite incredibly, this masterpiece is not and never has been available on DVD release in the UK; however, a good print of it is available in a French release, and demands to be seen by anyone interested in cinematic art, and who has no problem either with Bengali dialogue or with French subtitles.) And Ray’s film is itself based on a story by Bibhuthibhushan Banerjee, which has not been translated into English as far as I know. Is Shakespeare still our contemporary? The idea of “making allowances” for Shakespeare seems to me some kind of ultimate in benighted presumptuousness. I assume that if we feel something, he felt it too. Shakespeare was certainly learning as he went along, and learning very quickly. But I believe, and thus assume, that he always knew what he was doing. Even if he did not realize quite how extraordinary it all was. Thus writes Tony Tanner in his excellent Prefaces to Shakespeare. – Shakespeare didn’t mean it, sir! – Shakespeare did mean it sir, I answer, very fierce. It hardly gets us very far. However, it strikes me as highly unlikely that this should be so: if, in addition to being born great, achieving greatness, and having greatness thrust upon us, some of us may also stumble upon greatness by mere accident, then why aren’t more of us “great”? Why don’t we have literary canon teeming with accidentally great Shakespeares? Shakespeare, we are often told, is “a man of his time”. And “a man of his time” wouldn’t have thought twice about creating Shylock as an antisemitic stereotype: if we see Shylock differently, we are merely viewing him from a contemporary, and not from a Shakespearean, perspective. Similarly, we are supposed merely to laugh at Malvolio’s discomfiture: they were cruel times, and Shakespeare would have revelled in the cruelty of Malvolio’s treatment, because he was “a man of his time”. Or if we find intimations of nihilistic despair in King Lear, or a sense of existentialist terror, then that is once again our modern sensibilities kicking in, and nothing to do with Shakespeare, who, as “a man of his time”, would have believed unquestioningly in Christian doctrine. And so on, and so forth. One reason why it’s so difficult to argue against the “man of his time “argument is that those putting it forward never bother defining what it is to be “a man of one’s time”. We are all people of our time in the sense that our own time is the only time in which we can live: so far, so bleeding obvious. But presumably, more is intended, if not explicitly stated, in the phrase “man of one’s time”. What more is intended, I think, is that “a man of his time” is someone incapable of looking beyond what was commonly accepted in his own time. And Shakespeare, it is asserted, was just such a person. Why such an assertion should be made in the first place, I really do not know. It is obviously nonsense to claim that no-one can think beyond the intellectual boundaries of their times, for if that were so, thought would not advance over the ages. Or, at least, thought would not change – it would remain stationary. As since this is clearly not the case (for if it were, Shakespeare would remain our intellectual contemporary, even if, as is alleged, he were merely “a man of his time”), we must accept, I think, that there must have existed at least certain people capable of thinking beyond their own times. And once we accept this, I do not see any reason why we should insist that Shakespeare, almost unanimously acclaimed across the centuries as a supreme genius, should not be considered one such person. Of course I am not claiming that Shakespeare had foreknowledge of intellectual developments of the last few centuries, or that he foresaw the various historic upheavals between his time and ours. Despite the awe we Bardolators cannot help but feel in the presence of his works, Shakespeare wasn’t the Omniscient Almighty. But perhaps he came closer to being so than any other human being. All right – if that seems too extravagant a claim for the sceptical reader to swallow, I’ll let that go: but it may be maintained, even to the sceptic, I think, that there is nothing we have learnt about humanity, either through scientific developments or new branches of thought or as a consequence of historic events, that is incompatible with the view of humanity Shakespeare presented. So, for instance, as soon as Freud developed new ideas about the nature of the human mind, the plays of Shakespeare, far from becoming outdated, yielded new perspectives. This does not mean that Shakespeare foresaw Fruedian ideas, and it doesn’t even mean that Shakespeare would necessarily have agreed with Freudian ideas had he known them; but it does mean that he had depicted humanity to such depth and with such accuracy, that the observations we may make and the theories we may propound about humans in real life, we may make and propound also about the fictional characters in his plays. And how can it be possible, one wonders, to depict characters to such depth and with such accuracy merely by accident? The answer, I think, is that it isn’t. If it is possible for us to see Malvolio from a sympathetic viewpoint, it is because Shakespeare designed it to be so. If it is possible for us to view Shylock as a tragic figure, it is because Shakespeare saw the tragic potential in what would otherwise have been merely an antisemitic caricature. This is why the question “Is The Merchant of Venice an antisemitic play?” is so pointless: just as Mozart and da Ponte, in Cosi Fan Tutte, had taken a simple-minded misogynist anecdote and had transformed it into something that utterly transcended its source, so Shakespeare has taken a story that in its bare outlines is most certainly anti-Semitic (“heroic Christians outwit murderous Jew”), and had transformed it utterly into something very rich and strange. And he did not do this by accident. We find the depths in Shylock for the very obvious reason that Shakespeare had put them there. The alternative is to imagine that we are nowadays more knowing and more intellectually sophisticated than Shakespeare was, and being so, we can find elements in his work concerning which poor old Will himself really had very little idea. And, as Tony Tanner put it, that really is “some kind of ultimate in benighted presumptuousness”. I do realise that this blog is called The Argumentative Old Git, and I realise also that I tend to post quite a bit about Shakespeare. But it’s a bit disconcerting all the same to see so many people directed to this blog as a result of searching on the words “Shakespeare” and “git”. What were they looking for, I wonder? Eugene O’Neill was a strange one. Long Day’s Journey into Night strikes me as a supremely great dramatic masterpiece, and continues to affect me profoundly; yet nothing else he has written – not even the undeniably powerful The Iceman Cometh – seems to come close to that achievement. A Moon for the Misbegotten was written shortly after Long Day’s Journey into Night, and, like the earlier play, again features the character Jamie Tyrone, a depiction of O’Neill’s own brother who had drunk himself to death. Here again we see the tortured, guilt-ridden alcoholic, haunted by the past, and attempting vainly to mask his emotional vulnerability and self-loathing under a veneer of nastiness and cynicism. But A Moon for the Misbegotten cannot really be seen – and nor was intended to be seen – as a sequel to the earlier play. The chronology is all wrong for a start. Clearly, the action of this play takes place after Long Day’s Journey, as the parents depicted in that play are both dead when the curtain rises on this one; however, the first act of this play ends with a scene that had been narrated as an anecdote in the earlier play, so it becomes impossible to perform the two works as a Part One and Part Two of the same saga. Also, the earlier play was so personal for O’Neill that he had forbidden either publication or performance during his own lifetime, whereas not only did he permit both performance and publication of this work, he apparently lost interest in it to such an extent that he couldn’t even summon up the energy to make the revisions to it that he knew it required. A Moon for the Misbegotten is clearly not up to the standards of Long Day’s Journey into Night, although many of the elements that had made the earlier work so hypnotically powerful are present here also. But it doesn’t quite seem to work here. In the earlier play, the various repetitions had a cumulative effect: they conveyed a sense of these characters probing and picking at the same wounds over and over again because they could not do otherwise; but here, the repetitions merely end up becoming tiresome. I think the reason for this difference is that Long Day’s Journey into Night had explored why the characters were as they were, whereas here, we are simply expected to accept these characters as they are, without delving into whys and hows. There is no explanation given, for instance, for James Tyrone’s hatred of his now-deceasad father, or for the reasons he had taken to drink in the first place: we know these things from Long Day’s Journey into Night, of course, but since these pieces of the jigsaw are withheld here, we don’t really see much more to James here than a pathetic, self-pitying drunk. And the drunken confessional that had seemed so raw and painful in the earlier play here runs the risk of appearing merely maudlin. It’s hard to see why a dramatist with the experience of Eugene O’Neill should write it like this: perhaps his own emotional investment in the play blinded him to its shortcomings. One can but speculate. But the long drunken confessional scene in Act Three of this play does not quite have the raw power that perhaps it should have had. Josie is twenty-eight. She is so oversize for a woman that she is almost a freak – five feet eleven in her stockings, and weighs around one hundred and eighty. Her sloping shoulders are broad, her chest deep and large, firm breasts, her waist wide but slender by contrast with her hips and thighs. She has long arms, immensely strong, although no muscles show. The same is true of her legs. She is more powerful than any but an exceptionally strong man, able to do the manual labour of two ordinary men. But there is no mannish quality about her. She is all woman. The map of Ireland is stamped on her face, with its long lip and small nose, thick black eyebrows, black hair as coarse as a horse’s mane, freckled, sun-burned fair skin, high cheekbones and heavy jaw. It is not a pretty face, but her large dark-blue eyes give it a note of beauty, and her smile, revealing white teeth, give it charm. [O’Neill] could not really regard theatre as the collaborative activity it so patently is. Time and again, O’Neill lamented the process of staging his plays, complaining that the ideal play he had in his head never existed in production. Whereas playwrights generally welcome the new life that actors bring to their work, O’Neill saw it as a betrayal. So strongly did he feel this that he virtually never went to any productions of his plays, only attending rehearsals in order to advise and to cut when necessary. Josie too is “misbegotten”: like James, she too is lonely and emotionally vulnerable, but masks her vulnerability under a harsh and bitter jokeyness. The climactic confessional scene can, I imagine, be very effective, but O’Neill surely takes too long to get there, and the change of mood between the broad comedy of the long first act and the more serious tonality that follows is surely too abrupt a gear-shift. The other principal character is Josie’s father, Phil Hogan, a wily tenant farmer who is absent from the more heartfelt scenes, and appears to be present only to provide a bit of broad stage-Oirishness. Given the length of his role, this is hardly what one would expect from an experienced dramatist at the peak of his career. But despite all this, this play cannot be dismissed: there is something there, something that is heartfelt and raw. When Josie offers James the forgiveness he had so desperately sought, there is, despite everything, something very moving about it. But it’s difficult to consider any of this outside an autobiographical context: Josie’s forgiveness is surely what O’Neill himself wanted to say to his now dead brother. O’Neill is clearly exorcising his own ghosts here, and, like his literary idol Strindberg, was using the most public of art forms for the most private of purpose. However, one can’t help wondering whether there would be anything moving at all about any of this had we not known James Tyrone from Long Day’s Journey into Night. Was Eugene O’Neill a great dramatist? It’s hard to say. If I knew only this play and no other, I wouldn’t have thought so. But whether or not O’Neill was a great dramatist, Long Day’s Journey into Night remains a very great drama: there, everything came together just right. Perhaps O’Neill knew this himself. And perhaps it was for this reason that this, of all his plays, was the one he did not wish published or performed in his own lifetime. But when one knows that earlier play, something of its greatness seems to rub off on this one also. All text © 2010-7 Himadri Chatterjee at The Argumentative Old Git, unless otherwise stated.